Researchers at Los Alamos National Laboratory in New Mexico and partners have tested the use of ionic liquids to break bacterial biofilm layer on skin. A release from the laboratory explains that biofilms, which are like a protective tent over a colony of harmful bacteria, make the treatment of skin infections especially difficult. Microorganisms protected in a biofilm pose a significant health risk due to their antibiotic resistance and recalcitrance to treatment. Biofilm-protected bacteria account for some 80 percent of total bacterial infections in humans and are 50 to 1,000 times more resistant to antibiotics than simpler bacterial infections. The release quotes researchers David Fox as saying, “In essence, we may have stumbled onto a magic bullet. Through a robust screening strategy, our research team has identified a unique class of materials, known as ionic liquids, which both neutralize biofilm-forming pathogens and deliver drugs through the skin. We extended our current capability in antimicrobial platforms with ionic liquids to new heights by partnering with Dr. Mitragotri at UCSB, who is an expert in transdermal drug delivery platforms. The merger made perfect sense. This work could have especially useful applications for military medical treatments, he noted, where soldiers in the field can be exposed to bacterial infections that are particularly difficult to treat. Biofilms often persist in the periphery of an actual wound, beneath an intact, healthy skin layer and the difficulty of their treatment is largely due to the outermost layer of the skin, the stratum corneum, being a natural barrier for drug delivery. “Clearly, the ionic liquids would be of special benefit to our warfighters where exposure to biological agents in hostile environments is likely. Topical application as a prophylaxis or direct treatment to an open wound could buy enough time to reach the proper medical facilities when in an austere environment,” he said. Importantly, ionic liquids can be derived from very cheap starting materials that are FDA approved and are extremely stable to high temperatures and pressures, which are necessary traits for commercialization in real-world applications. In a groundbreaking manuscript appearing this week in the Proceedings of the National Academy of Science, as part of a multi-institutional effort between Los Alamos, University of California Santa Barbara, Dixie State University and Northern Arizona University, researchers explored exploiting ionic liquids both in a concerted effort to combat antibiotic-resistant bacterial biofilms in skin, as well as for topical transdermal drug delivery. The comprehensive strategy resulted in the identification of ionic liquids that are effective at disrupting biofilms, neutralizing pathogens, and enhancing delivery of antibiotic into skin. 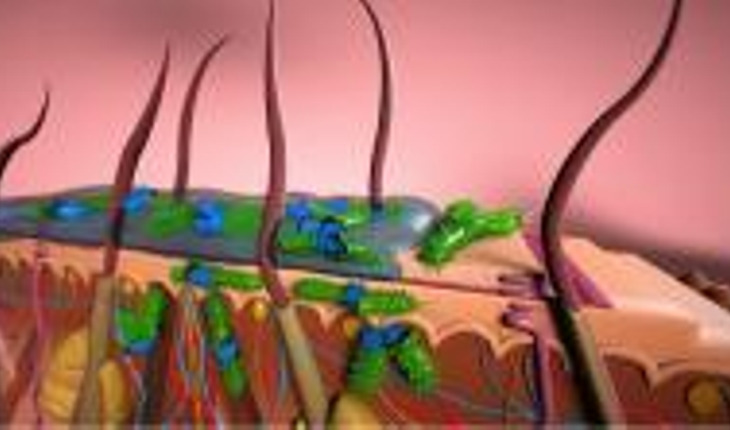 Biofilms are a major cause of chronic wounds and wound degeneration. Wounds from infected surgical incisions result in 1 million additional hospital days. Additional causes of bacterial infected wounds include traumatic injuries, as well as diabetic foot ulcers, venous leg ulcers, and pressure ulcers. The total economic burden of skin disease was estimated to be approximately $96 billion in 2004, and the prevalence and healthcare costs for skin disease have been increasing over the last three decades. Bacterial infections in the skin are among the most common diagnoses in hospital patients, accounting for some 10% of all hospital visits. Staphylococcus aureus infections acquired in hospitals, which account for only 16% of nosocomial infections, are estimated to result in $9.5 billion in extra patient costs and 12,000 deaths annually. The comprehensive approach is unique in that the team examined a panel of in-house synthesized ionic liquids and enabled the discovery of one ionic liquid, choline-geranate, which showed excellent antimicrobial activity, minimal toxicity to epithelial cells as well as skin, and effective permeation enhancement for drug delivery. Specifically, choline-geranate was comparable with, or more effective than, bleach treatment against established biofilms of Salmonella enterica and Pseudomonas aeruginosa, respectively. In addition, choline-geranate increased delivery of cefadroxil, an antibiotic, by >16-fold into the deep tissue layers of the skin without inducing skin irritation.